​These Old Dutch Salt & Vinegar Fish Chips will have your taste buds swimming for more! Fish & chips anyone? 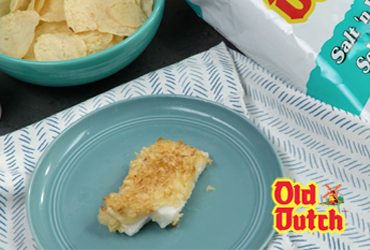 These Old Dutch Salt & Vinegar Fish Chips are a fun way to combine the famous combo. Fish & Chips takes on a whole new meaning with these Old Dutch Salt & Vinegar Fish Chips! Preheat oven to 400°F. Place fish on a parchment-lined baking sheet. Sprinkle with salt and spread mayonnaise over top of each fillet. Cover entirely with crushed Old Dutch chips, patting gently. Bake for about 15 minutes, until fish flakes easily with a fork. Serve to your friends and family, and enjoy!